Imagine if the government announced plans for new, faster, 21st Century trains to run East to West across London but didn’t bother building any new tracks, tunnels or bridges. Pretend for a moment that mobile phone operators offered new deals for 5G super-fast mobile streaming but forgot to build new antennas, networks or upgraded tech to back it up. So why do we expect volunteering, social enterprise and community action to flow across the country when we rarely think about the structures and networks that underpin this activity? The case for economic infrastructure is well established and we spend billions every year on new railways, broadband, the National Grid, our ports, roads and more. But the case for social infrastructure is strangely absent - and then we wonder why our country sometimes feels like its falling apart. We can’t expect to maintain our social fabric without taking care of our social infrastructure. These are the long-term assets which support the flow of social action, volunteering, co-operation and social enterprise. These are the places and structures and buildings or clubs that enable people to get together, meet, socialise, volunteer and co-operate. These spaces of assembly are often - but not always - buildings. They might be civic, religious or traditional. They could be private or publicly or socially owned. Some are indoors, some are outdoors and some are digital. While others are more occasions than places, like Bonfire night or Halloween. While policy wonks, researchers and politicians seem to have a blind spot when it comes to social infrastructure, others don’t. 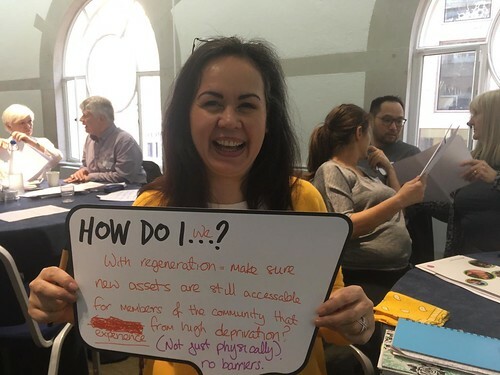 The Big Local partnerships in Southampton, Sale and Lawrence Weston all know about both the value and the fragility of their community spaces. While the Government, Social Enterprise UK, NCVO or ONS data might suggest that volunteering rates have remained relatively stable in recent years; that social enterprise is on the rise; or social cohesion is holding up across the country, there are many places in the UK where the reality feels quite different. There are echoes here of the idea that the benefits of UK GDP growth have not been felt by people in many parts of the country. The refrain that “That’s your GDP, not mine” perhaps also applies to the statistics in the social sphere. So while the Port of Southampton hs has received £280 million of investment over the past five years, just a few miles away, Harefield Community Centre is shut, the local church has been knocked down and the local pub was closed down with a week’s notice. While Greater Manchester has seen billions pour into Media City and Metrolink, Sale West Youth and Community Centre is under threat, local shops have been demolished, the sports field is fenced off and two pubs have shut. While Bristol has seen billions go into shopping malls and rail upgrades, people in Lawrence Weston are struggling to keep their youth centre alive. Other spaces are falling apart, the library has gone, and all five pubs have closed. The collapse of social infrastructure has not gone unnoticed here. The national picture is startling. 28,000 pubs have closed since the 1970s, 121 libraries closed in 2016 alone, 600 youth centres closed between 2012 and 2016, 1,200 children’s centres have shut since 2010, 50% of post offices have closed over the last 30 years, banks in Britain closing branches at record rates, bingo halls have fallen from 600 to 400, over 200 playgrounds have closed since 2014, one in two skittle alleys have closed in the last few decades and one in five regional museums at least part closed in 2015 alone. It's time to think about upgrading society’s operating system.